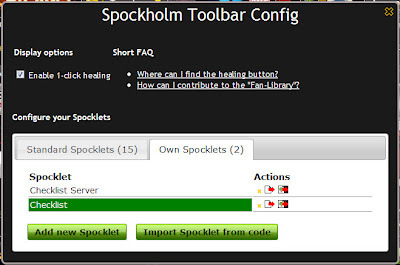 The Spockholm Toolbar needs to be installed in the form of a Chrome Extension or FireFox Add-On. 1. Go to http://cdn.spocklet.com/spockholm_toolbar_lite.user.js. You will see a standard warning about Extensions in the bottom left of your screen. Click continue. 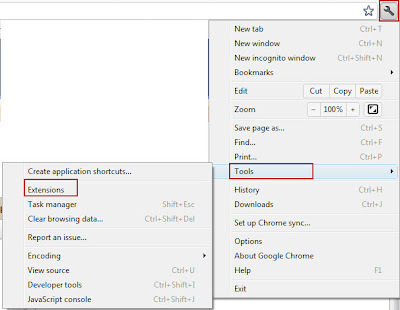 UPDATE: If you have the latest version of Chrome, you will need to download the toolbar from the Chrome Web Store. Use the link below or go here for more details. 2. Click Install from the verification popup. What's nice about the Spockholm Mafia Toolbar Extension is it only has access to your Facebook application data and not everything else you do on your computer like most of the other toolbars. 3. You will see that the Extension was successfully installed in the upper right corner of your screen next to the Chrome Wrench icon. 4. 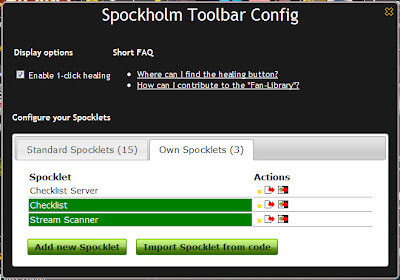 To manage your Spockholm Toolbar and/or verify that it is properly installed, click on the Chrome wrench icon, click on Tools and then Extensions. 5. 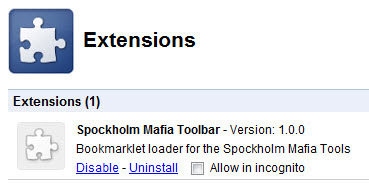 If properly installed, the Spockholm Mafia Toolbar will appear on your list of Extensions. From this page, you can also turn it off temporarily by clicking on "Disable" or remove it permanently by clicking on "Uninstall". Installing the Spockholm Toolbar in FireFox requires an extra step because you need to install Greasemonkey first. 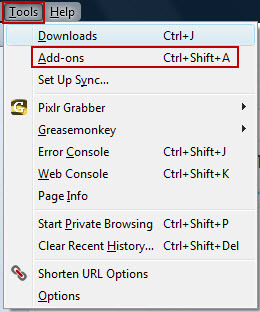 Go here to install the Greasemonkey Add-On and click on "Add to FireFox". Wait the 5 seconds for it to prepare. 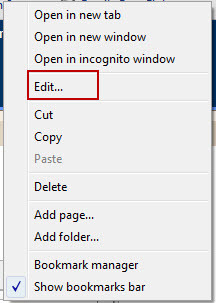 Restart FireFox from the installation popup that will appear in the bottom left corner of your screen. If you did everything right, you will now have a cute little smiling monkey in the upper right or bottom right corner of your screen. If you don't see this monkey anywhere, you can check from your Tools Tab to make sure Greasemonkey is enabled. To do this go to the Tools Tab located in the upper right of your screen, click on Greasemonkey from the drop down menu and make sure there is a check next to Enabled. 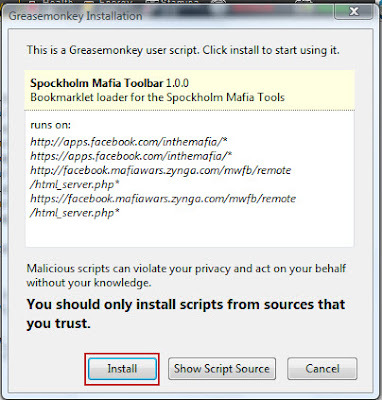 If Greasemonkey isn't installed properly and enabled, you won't be able to install the Spockholm Toolbar. 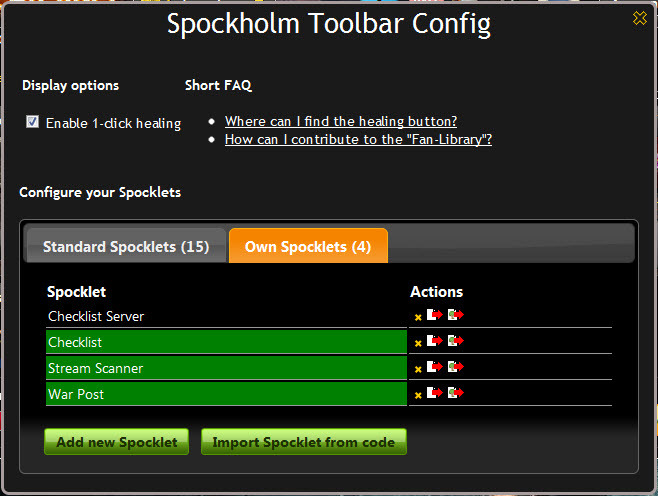 Now you can install the Spockholm Toolbar by following the step below. 1. 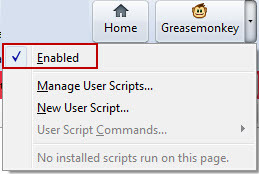 Ensure that Greasemonkey is enabled. You can check on it from the Greasemonkey icon located in the upper right corner of your screen. This is also how you can turn it off when needed. 2. Go to http://cdn.spocklet.com/spockholm_toolbar_lite.user.js. You will see Greasemonkey doing its thing. 3. Click on "Install" from the popup window. 3. When the installation process is complete, you will be notified in the lower right corner of your screen. 6. 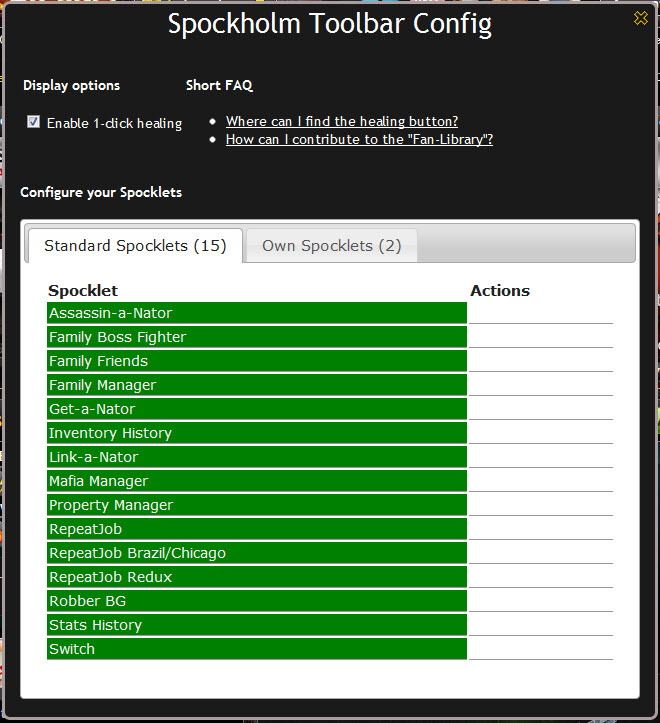 To manage your Spockholm Toolbar in FireFox, click on Tools located in the and then Add-ons. 7. A list of your Add-ons will appear. From here you can temporarily turn off the Spockholm Toolbar by clicking on "Disable" or delete it by clicking on "Remove". Once the Spockholm Toolbar is installed, it will automatically load on top of the Game Header. Here is closer look at the items you will see on the surface and their function. Contains a standard library of Spocklets as well as any scripts you add manually. Search Bar Use to find and launch any Spocklet that is in the database. A quick reference to see your experience ratios needed to level up. Help Team Spockholm help you and maintain their servers. Configuration Button Use to manually add Spocklets or other bookmarklets to the Spocklet Drop Down Menu. Two features that you will notice right away is that the App Ticker is removed and the annoying ZMC popup is automatically closed for you. You will also get some additional information on all the Job Pages. When you load a Job Page, the job with the best experience/energy ratio will be highlighted in green. In the example below, I went to District 2 in Chicago because that one has the best ratios. The second job down offers the most experience per energy so it is highlighted. In addition to the exp/energy ratio of each job, you will also see how many of each job you can do with the energy you have available on hand and how much energy you will have left over once you do the number of jobs stated. If you don't have enough energy to do a job, the energy cost will appear in red. The energy left will be your total energy on hand. If you have enough energy to make it to the next level by doing a job, the job will say Level! next to the experience gained. A very cool feature of the Spockholm Toolbar is you can run scripts in a framed mode if you use the Spockholm Drop Bar or launch a script through the search bar. There are 2 ways to launch a Spocklet. 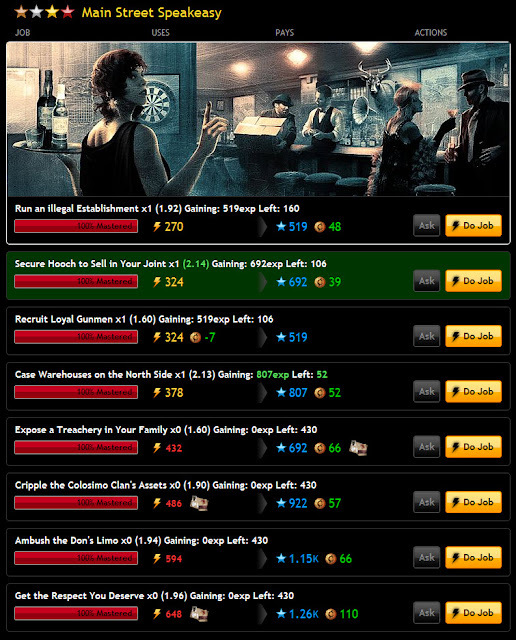 The first is to click on the Spocklets Drop Menu and a list of popular Spocklets will appear. Simply click on the one you want to use and it will load. If you want to use a script that isn't listed in the Drop Menu, go to the search bar and type in the name of the Spocklet you are looking for. In the example below, I want to use the Mafia Manager. Simply type it in the search bar select it and it will load. Eventually all the Spocklets will be added to this feature but for now only the ones that appear or are added on the Drop Bar will show up. Scripts will work in the framed state of the game so you will no longer need to additional step of unframing. In the example below I'm running the Assassin-a-Nator and you can see my game in framed. The Configuration is what you will use to add more scripts to the Drop Down Menu. Find it at the far right of the toolbar. There are two pages and the Configuration Button will appear green when they are open. The first will list the 15 standard Spocklets. 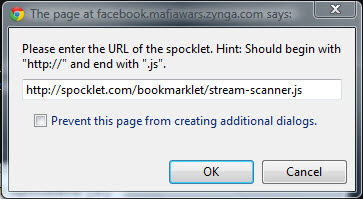 The second page provides the option for you to add additional Spocklets or bookmarklets from other script writers. There are two ways to add a Spocklet to the Drop Menu. The first is to click on the "Add new Spocklet" button from the second page of the Config options. In the example below I will add the Stream Scanner bookmarklet. First you need to enter the name you want it to be called and click OK.
Next you will need to enter the URL of the Spocklet. This isn't as hard as it sounds. 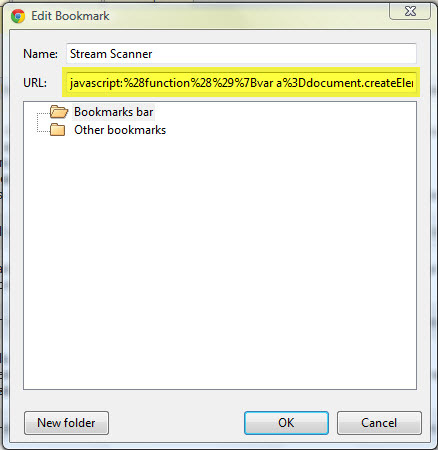 To get the URL code of any Spocklet, find it in you bookmark toolbar and right click on it and select edit. Now copy the code in the URL: box. Paste it somewhere and copy the url which is located in the code. It will start with "http:" and end with "js" You could copy it directly from the bookmarklet shown above as well but I find it's easier to paste it somewhere first. Now paste the URL into the box. The Spocklet will appear on the Config Page and it will be listed on the Drop Down Menu. The second way to add a Spocklet or other script to your menu is to use the "Import Spocklet from code" button. You will need the Base64 code of the script you want to add. The easiest way to get this is to go to http://base64decode.org/ and enter the code. The new War Post script hasn't been added to the Spockholm Mafia Tools site. This Spocklet will post War Help request to a group page instead of your wall. After converting, the Base64 Code is shown below. Past this code into the import box. The War Post will now appear on your list. And it will show up on your Drop Menu. 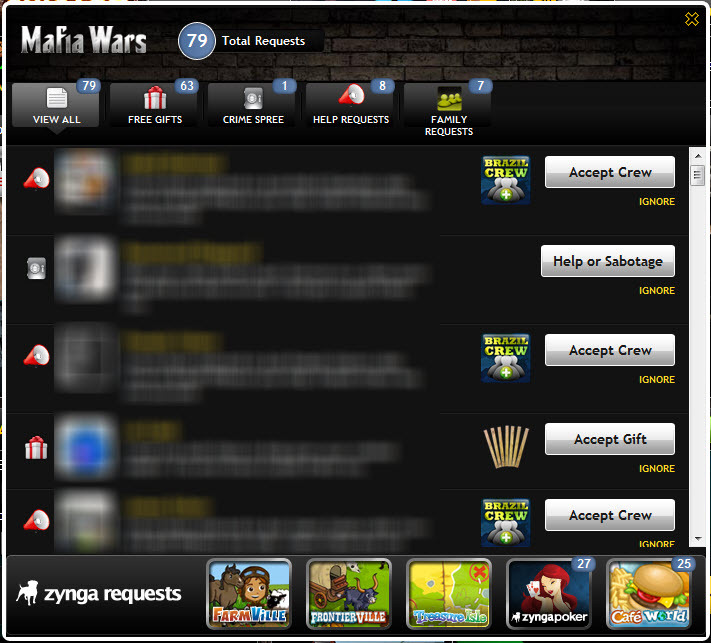 If you want to share one of your additions with your mafia or group there is an option to do that. Click on the little Export icons. The first icon will generate a post for your wall and the second one will publish to a group page. The post won't do anything when you click on it and it's purpose is to share the code. If you see something you like, copy the code and paste it into your toolbar to add it. Another feature of the Spockholm Toolbar is the ability to heal with one click. Go to the Config button and click on the "Enable 1-click healing" box. Simply click on the little heart next to your health and you will be healed in one click (assuming your heal timer is ready to go). When used properly, your health will flash a few times and you will be healed. The function will use New York currency. A banking feature is currently in the experimental phase and will be released shortly. Pistol Pete created the video shown below to review the toolbar. This is the first version and there will many updates in the future. Thanks to Martin, Pete Eike and Mike for answering my many questions during the beta testing phase of the Spockholm Toolbar. Article written by Jennifer Patterson, Creator of the MW Loot Lady Blog, The Mafia Wars Loot Lady Facebook Fan Page and Co-Host of The Informant Podcast. Thank you, Jennifer! You and Team Spockholm f*cking rock! I am so happy is as my other half! We're both avid players and love the toolbar! They've really done a great job with this. I just hope this game doesn't die and all this effort go to waste. What about a Spocklet for the Family Battles? Great tbar, i miss an export/backup feature, hopefully in the near future. You have all OUTDONE YOURSELVES ONCE AGAIN !! How To Make That does not happen again?? 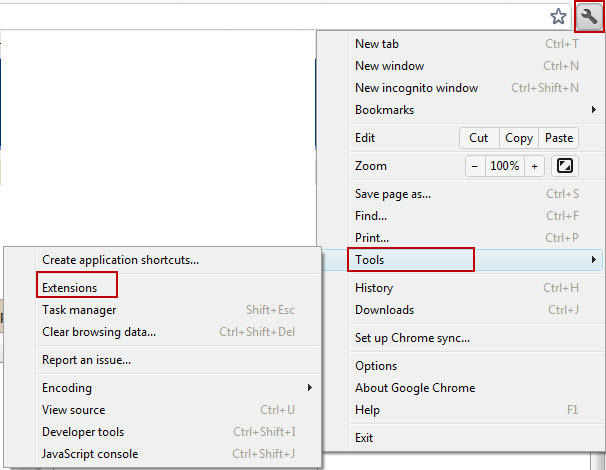 I have installed on Chrome and it appears on extensions menu as properly installed, however toolbar will not load up. I have restarted chrome and also computer...still nothing. I have tampermonkey installed on Chrome because of wall scrubber. Is there a conflict here, Anyone has a clue as to what I'm doing wrong? I would not load up on Rockmelt either. And it also appears on extensions menu as properly installed. I do not have tampermonkey on rockmelt, just mw add-on by itself.....any help appreciated! thanks! Brilliant, I've been waiting for this. Thank you so much for writing such a comprehensive guide, especially for adding spocklets that aren't included with the toolbar. I've installed it using Greasemonkey and all seems well so far, not needing to unframe and one click heal are just two of the many useful features. Team Spockholm totally rock! I love your blog Jennifer but I love you more.Will you marry me and we'll have little Captain Kirk's running around the house? SCIENCE! 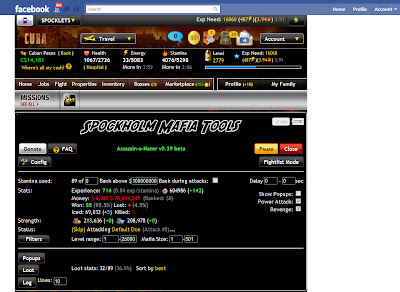 Hi,I am in need of help to remove spockholm from my mafia on my mafia home page.It's not working right in i'd need to DELETE it so that i'd can redo it.anyone that is able to help me i'd sure would appreciate it very much!Thank you! im trying to add the loose slots to the bar "http://spocklet.com/bookmarklet/loose_slots.js" everytime I try to run it, says it needs to be reinstalled. Any Idea's? (the spocklet I got the URL from works fine. Other than that all is good, and works well thank you. Is it normal for the toolbar to disappear and need to be reloaded each time MW is opened? I installed it earlier and tried Link-a-nator all I got was spinning bullets so I removed chrome and reinstalled (someone told me it might work?? 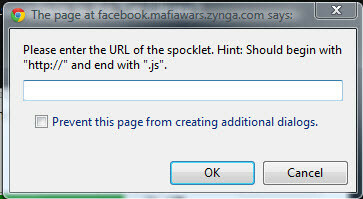 )..Ive reinstalle the spocklet toolbar and ive got the same problem, any help please? how do i get the minipacks from there? anybody knows? i already have under checklist configuration --> minipack, it's asking me.. Set item to remaining time (dd:hh:mm:ss or hh:mm:ss or mm:ss) what do i put there? tried 00:00:00 on the first time and now i have an 8hr countdown, had the MW-toolbar installed b4 but it has frozen my ff on the first instance so i ddeinstalled, ty for gimme a hint..
what is the spockholm golden tool bar? what do i need to do to get an account to get it. it enabled on my tool bar two days ago and had a spocklet called assassin burst that was better than all the other fight scripts i have ever tried. nobody else admits to have seen it and i know im not crazy please tell me something. How does one create an account? When running Assasinator using the tool bar, I go to click on my ices and no pop up appears so I can cut and paste my ices. Is there a fix for this? Is there an add on for safari? my spockholm mafia war do not appear any more? how to run it again? I downloaded and Install the Toolbar on Chrome but it doesnt apper at all. I've tested more than 3 toolbar's so far and they work but Spoch doesnt. Any ideas? I don't know what is going wrong (I am loading with Firefox). I can get to the point of install (#3) but then I never see the little greasemonkey working and the toolbar never appears in my addons. Any suggestions? Having problems downloading the toolbar. I need code for War Hunter..
HTML also...is this what happens when you don't donate???? Has anyone installed the toolbar on Firefox 12 yet? I'm reluctant to upgrade until I know it works. I installed the toolbar today and have been checking out it's feature. It's really great and helpful. Though I faced a small glitch. I was checking out the Property mangaer. The first thing I saw was the green Collect and Bank button, so I pressed it.. And got a log. Well at that time, except for a few properties in New York and Las Vegas, no other city was ready for collection. So, got the report 0 collected from Chicago, and so on.. Anyways, after that I realized, there was an option to apply or remove crew, which by default was applied. Went back to the cities to check. And yes, crew was applied even though nothing was collected and expired too. It really pinched as I had 6 crew members and 5 of them were applied only for properties. So could it be possible that you do some check and not apply crew and collect from property when it's not ready. in FF12 the Assasin-A-Nator would freeze after going to hospital. It acually heals, but the green sign saying "Going to hospital..." stays there, would not continue fighting and i have to pause and restart to get it going. any fix? I am impressed by this site and really gonna share this site to my friends. Just wanted to say that you all are awesome. I've been playing MW the hard way for years and this has brought back the joy of playing this game. Thank you very, very much for your hard work. Try reloading the page or use the link below. Sometimes it's out of sync with Facebook and won't fully load. Been trying to install the toolbar into Chrome Canary... but it's telling me that extensions, apps and user scripts have to be added via the Chrome web store. Is this something new? I have it on regular Chrome, but it won't let me clear out cookies, so I was using Canary to play. Double check on your 'tools' tab that Greasemonkey 'enabled' is checked. That was my problem earlier. I'm not sure but I have the same problem when I try to play on an unframed page, the features of the toolbar work alright like they told us they did even on a framed page but my pages were cut off as well, and I had no scrolling at all to fix the problem, so I have to run the scripts with the toolbar installed on unframed pages. I hope this helps you. How do I remove the Spockholm toolbar? 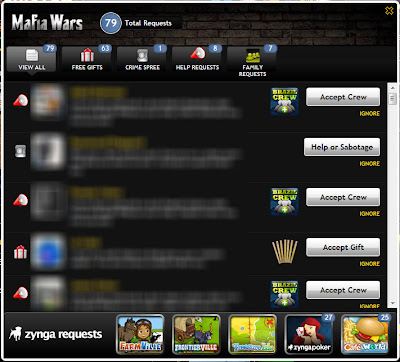 If Zynga finds out you are using it they will take your account away. I hope everybody knows this that is now using the toolbar. This is the most ridiculous thing I've heard so far. If Zynga takes accounts away for this than why do I and tens of thousands of others still have theirs. I readily admit to using it and Zynga reads this blog faithfully. Pistol Pete, one of the creators is on the Player Advisory Committee as well as myself. If you are too scared to use common sense, go to your Extensions or AddOns for which ever browser you use and disable it. I included those steps in this post so obviously you didn't read it. 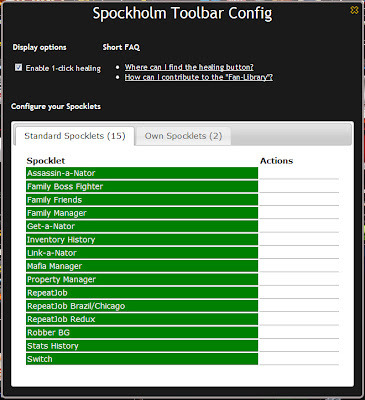 Is there a way to add the Spockholm toolbar to IE. Or is Microsoft so paranoid they do not allow extensions in IE!!!! i need to know th same ting, been having problems with chrome sometthing about possible dns flushing but cant imagine why its a brand new cmputer and my ff s closng at least 3 times before it stays open so i can play have no idea why but i was hinking of using iexplorer but ddon't fiind any info on it concernig these add ons. help? mary >>>mary_groves229@outlook.com pls help! My chrome was freezing so I updated it... wrong choice. It disabled/deleted my spockholm toolbar and all spocklets. As of yet, I still cannot reload/reinstall 3rd party extension. Can anyone help me??? my toolbar stopped working and i had to delete it. when i tried to install it again, i got a message that i had to get it from the chrome extension store but it is not there. how do i get it back? Need to know why? Vista does not show the download of spockholm spcklets, I have 2 players that are vista and they cannot get the tool bar. One is Firefox user and one is Chrome. So browser is not the issue. U came here to ask the same question.. I just started using this The Spockholm Mafia Toolbar onto COMETBIRD version 11.0 quite similar to Firefox. Great and wonderful working very well. Keep up the good work. I'm trying to add toolbar to firefox and have added Greasemonkey but when I click on the toolbar install all I get is a page of script. You state it runs on Firefox but I can't figure out how to do it. I clicked the link and it is only the js. I am on a Mac. After I updated the toolbar to 1.0.1 it's no longer working. I'm using Firefox latest beta v18, and vista OS. It ran the toolbar v1.0.0 flawlessly. How do I go back? The same thing happened to me. I uninstalled the extension and tried to install it from the chrome web store but it says its not a CRX file. I can't find a solution anywhere. I just installed Safari to be able to run another account. Already running Chrome and FF on the other 2. Does the tool bar need Grease monkey when using Safari (similar to Fire Fox)? I just installed it and it does work, I just wondered if it is considered to be a disallowed script by Zynga. I changed my FB profile pic awhile back so I have had no image for some time. I haven't been able to figure out how to get the toolbar to work now that facebook has switched me to Graph Search. I am using Firefox 22.0 and Mac OS X 10.6.8. Greasemonkey is enabled. When I try to reinstall the toolbar, I get a message telling me that Greasemonkey needs to be enabled. When I click, I just get the message again. I use Chrome and every time I config my spocklets in the dropdown and sort the list, a few days later, the spocklets I put in there change and go back to the original ones...how do I save my customized drop down of spocklets?? This is a new issue...ideas...like a save button or something?? I have donated in the past and also today for the April Fool's item, but when I tried to load the golden toolbar it asked for a password. Either I don't have one, I've forgotten it, or ??? Can you help me?